I know, you're not used to seeing dessert recipes here. But you're at the right blog! Sometimes you just need a cookie, you know? 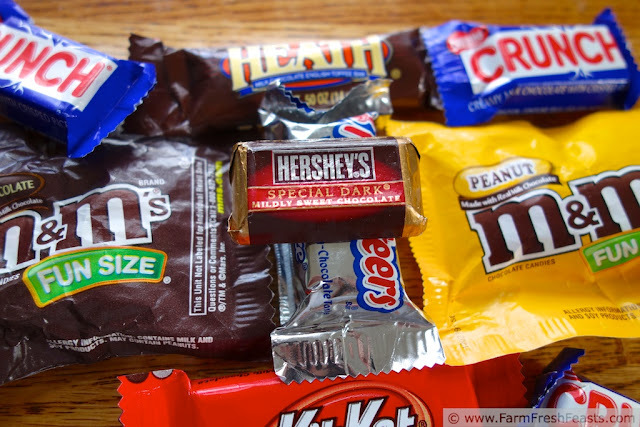 Have you ever noticed how the size of 'miniature' candies is increasing? When I was a kid, my favorite "miniature" chocolate bar was the Special Dark bar. Perhaps I was ahead of my time in recognizing the value of dark chocolate? I just knew I'd trade about anything (I'm talking about you, Bit O' Honey) for Special Dark bars. Now I'll share the recipe, so you can enjoy them with your mouth, not your eyes. The past few days have been painful and we could all use a cookie. I know chocolate always helps me. I like to mix up my cookie batter, like my pizza dough, at least a day in advance. I think it's better--so does the New York Times. So my instructions aren't going to start with 'preheat the oven'. In a large bowl (I use my stand mixer), combine the butter, shortening, and sugars until well mixed. 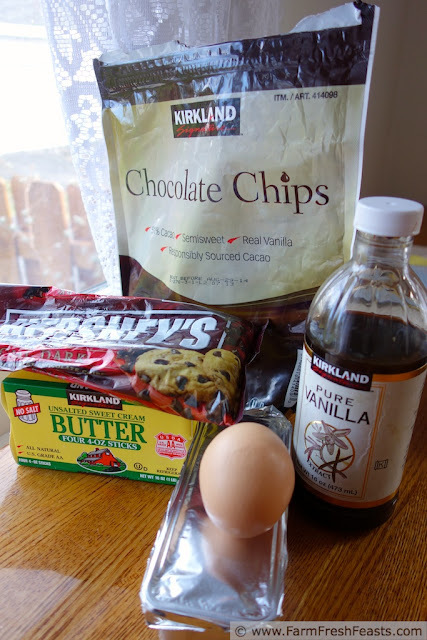 Add eggs and vanilla and mix thoroughly. Dump the dry ingredients on top (baking soda through flour) and mix well. Dump oats on top, and continue mixing another minute, then dump in the chocolate chips and cherries and mix until combined. 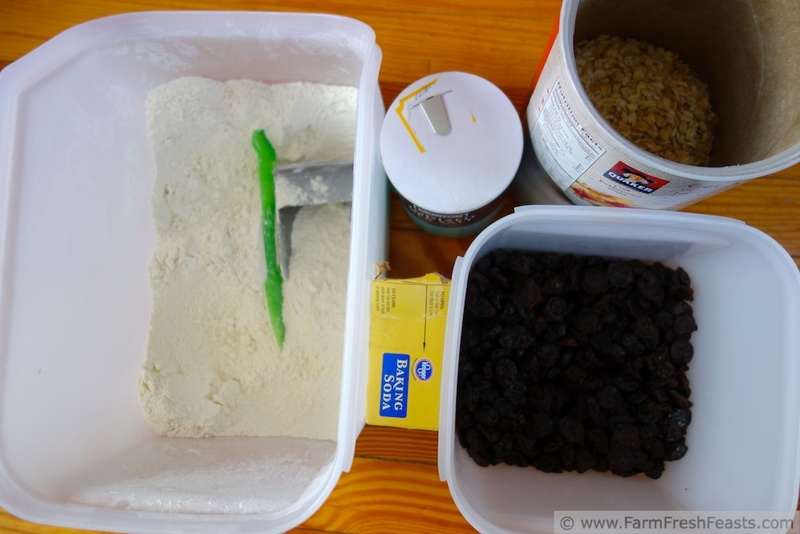 Transfer dough to a container and chill overnight or up to 3 days. When you're ready to bake, preheat the oven to 375 degrees Fahrenheit. Scoop the batter onto a sheet of parchment or directly on a cookie sheet. Bake for 9-10 minutes, then remove from oven and cool on the cookie sheet another minute or two before transferring to a cooling rack. Note: This recipe calls for both butter and shortening. 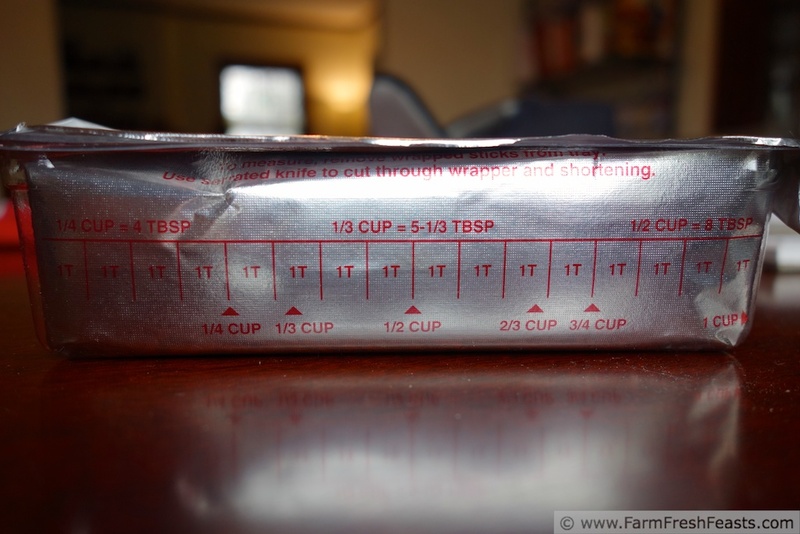 The original recipe called for packing a 2/3 cup measure with the stick (1/2 cup) of butter and filling up the remainder of the space with shortening. I hate to create extra dishes, so I kept my stick of butter in the wrapper and used shortening in stick form--the difference between 1/2 cup and 2/3 cup is 2 and 2/3 Tablespoons. That's a pain to measure, in my opinion. Know how I get around it? I make a double batch of cookies. Doubling that 2 and 2/3 Tablespoons of shortening makes 1/3 cup of shortening, which is quite easy to see on the stick. 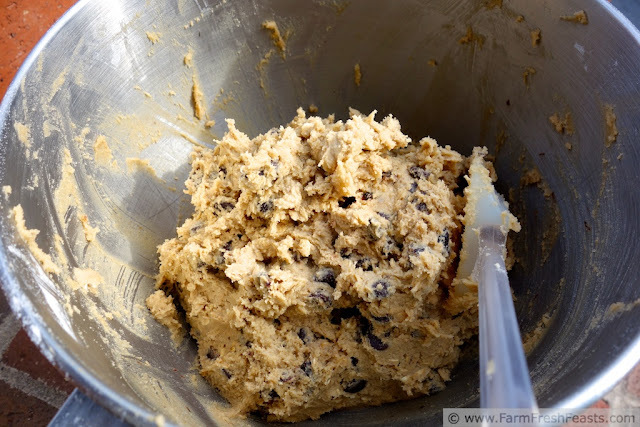 One shortening stick makes 3 double batches of cookies. And shortening keeps in the pantry a good while. It's simple, and easy, and just a little bit better than plain butter. Try it! This post is playing with the other happy eaters at What's Cookin' Wednesday at Buns In My Oven, and the Wednesday Fresh Foods Link Up at Gastronomical Sovereignty, What's In The Box at In Her Chucks, Taste and Tell Thursdays, the Farm Girl Blog Fest at Let This Mind Be In You, the Clever Chicks Blog Hop at The Chicken Chick and Foodie Friends Friday, Food on Friday (twice) and Tasty Tuesdays. Ok, I'm sold on the cookies before even checking the pantry! BUT....what if shortening is on one's avoid list? Coconut oil instead?? I've never used coconut oil in my kitchen, so I turned to the experts to answer this one. I polled several food bloggers and the majority say that coconut oil will melt too quickly and to just use extra butter in the cookies. Let me know how it works out! These look and sound fantastic! I just made cupcakes so I probably don't *need* cookies, but these look so good I might have to anyway! I love dark chocolate too, though I didn't when I was little. I keep good quality bittersweet chocolate chips in my fridge and sneak about a tablespoon every afternoon for a snack. I like your idea of an afternoon snack. My more fun than 'ants on a log'! I should make cupcakes more often for the heck of it--I do them for school parties, but never for fun. These look and sound delicious. Feed me Seymour. thanks for sharing. i love Special Dark as a kid too. Ok, even though I've seen Little Shop of Horrors I had to look up the reference, but now I'm with ya! These look incredibly good. The dried cherry / chocolate match is always good, in a cookie- even better. Do you have a chocolate/cherry cocktail to go with it? That would be yummy. And here I thought the double batch was just because the cookies are that good, although I'm sure that applies too. Dark chocolate and cherries is always a win. The cookies are that good, I'm lazy with math . . . take your pick! Me too! I have to keep my extra dough in the freezer because if the cookies are baked, I will eat them. Afternoon coffee, pre-breakfast snack with your morning tea . . . it's all good. Yummy! I love the chocolate cherry combination! Me too-though now I want to eat another batch, which really isn't fair to the pan of bar cookies on the counter. Must eat them first? You had me and chocolate and cherries. Throw in oats and I'm done. Definitely making these soon! Thanks for posting! They were really delicious--and now I need to make another batch (or two). your cookie recipe sounds great.......Thank you for sharing with the Clever Chicks Blog Hop this week; I hope you’ll join us again! I have that same bag of Costco chocolate chips in my cupboard, and those cookies look very tempting! And I love the combination of chocolate and cherries. Cherries are so important to Michigan, and what would Northern Michigan be without cherries?-- but we also have good cherries here in Washington State and I cook with them, fresh and dried, at every opportunity! How lucky you are to live near fresh cherries! I'm looking forward to seeing your recipes, as I'd love to add more fruit to savory dishes. These look like some of the best tasting cookies I have ever seen. Must give the recipe a try. Wow, a double batch? How big is your oven? 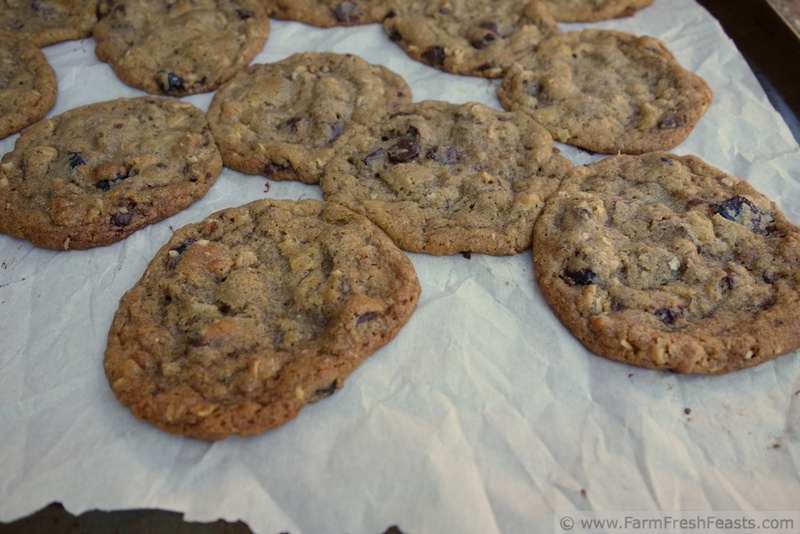 Thanks for sharing this absolutely yummy cookie recipe with Foodie Friends Friday. I'm such a cookie fan I can't help but trying all the recipes - and yes, I too like the combo of chocolate and cherries. These look so delicious!! I'm stopping by from Tasty Tuesdays blog hop! I decided to make some Chocolate Cherry Almond Magic Layer bars since I remembered how much I enjoyed this combination.